Stimulating and toning, fruity pomegranate is livened up with zesty grapefruit and extracts of orange and lemon for a fragrance that brightens, sparkles and creates a positive ambience. Pomegranate has an irresistible tangy fruit fragrance with bittersweet red fruit notes. It has a wide variety of uses in health and beauty treatments, thanks to its powerful antioxidant properties. Grapefruit essential oil, extracted from the peel of the fruit, has a wealth of therapeutic properties. It is thought to help relieve headaches, combat mental fatigue, aid depression and even curb hangovers. Relaxing and uplifting, grapefruit oil has a pleasant scent that can improve the mood and make you feel more alert. We’ve added in tangy notes of orange, also taken from the peel of the fruit and thought to have a direct effect on the olfactory system of the brain that can evoke emotional responses. Orange has been used for centuries to treat a wide range of conditions. It is both calming and uplifting, making it the perfect scent for brightening your mood first thing in the morning, or calming and relieving anxieties at the end of a long day. Finally, cleansing and purifying lemon essential oil is an instant rejuvenator, adding fresh notes to this delightful blend. Lemon evokes a feeling of brightness and positivity, creating an upbeat mood and happy ambience in your home. We use the purest essential oils in our room diffusers, without the addition of water or other ingredients that would dilute the scent. 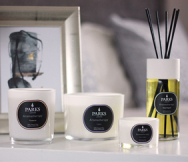 Designed to deliver six to eight weeks of beautiful lingering fragrance, our diffusers are a wonderful, natural way to fill your home with exquisite aromas. Our diffusers come in stylish presentation packaging that is beautiful to use or to receive. Give the gift of relaxation and help your loved ones unwind and enjoy our stunning home perfumes while their anxieties melt away.